I started drawing patterns when I was very small, maybe five or six years old. It started with quadrilled paper... where I would fill in the squares (quite neatly, for someone so young) with markers in color patterns I saw-- or "felt"-- inside my head. I also had a fascination with snowflakes, after seeing photographs of them in one of my grade school science books. As I grew older, the patterns grew more complex. I was maybe nine or ten when my first crude attempts at free-hand geometric patterns saw the light of day. Many of them were inspired by one of my favorite toys of the day: The "Spirograph." By the time I was thirteen, the drawings had become fairly complex. I would draw them on paper with the finest point black marker I could get my hands on, and then give them to my mother to use as bookmarks, in her vast collection of cookbooks. For the past 40-odd years, I have added small versions of these intricate designs to greeting cards, envelopes and letters... and sometimes they have just "appeared," during quiet moments. I have also collected rocks since I was little. Although the visual appeal of a rock does matter to me, my "relationship" with them is primarily kinesthetic... if the rock doesn't "feel" right in my hand I rarely keep it. 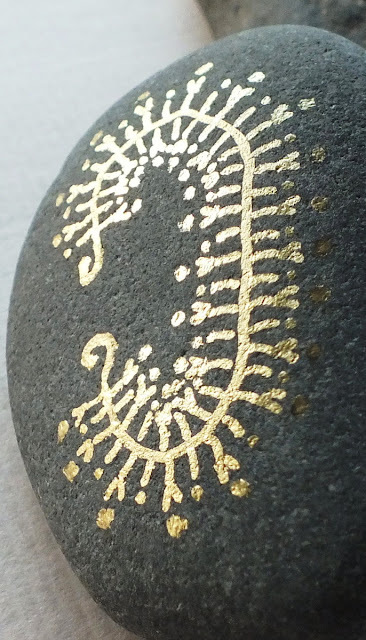 One day-- inspired in part by seeing photographs of some 1200-year old Viking designs on rocks-- it felt like the most natural thing in the world would be to add one of these patterns to a rock, so I tried to do so. The result was... well... "interesting," but not very appealing. The pattern was quite coarse, and barely visible on the stone. Many experiments followed, and the process has slowly evolved from a rough pencil drawing to using "sharpie" permanent markers to the final "version" of today, which uses permanent ceramic paint. I have also learned that the surface of the stone is an extremely important component in creating an Alchemy Stone. 95-98% of stones-- even those that appear smooth-- are too rough to be well suited for a delicate pattern. 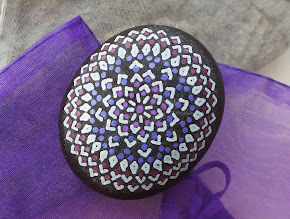 Painting these patterns onto rocks has added a whole new dimension to my "doodles." For one, rocks are three-dimensional, while a piece of paper is two-dimensional. For seconds, paper is "designed" to be drawn on... rocks are not. The rocks have to "show" me where the pattern goes. For a myriad reasons, most rocks do not lend themselves to having a design added: The surface texture is wrong, the color is wrong, the surface is uneven, the shape is wrong, the size is wrong. I will often start decorating a rock because I think I see what to do-- but then it turns out I really don't. There are a lot of "rejects." Apart from the ones that just don't "feel right," one tiny slip-up or mistake after an hour's work means the stone goes back where it came from. They mostly end up back on the beach, where the waves, sand and other rocks will eventually wear off the ceramic paint. I sometimes feel like I should apologize to them... but I am not sure whether to apologize for messing up a perfectly good rock with paint... or for failing to "see" what the rock told me to paint. Maybe it's both. As for the metaphysical angle? Well, that's hard to explain. People have kept rocks as talismans for millennia. People have been decorating stones for millennia. Some stones simply give me "a feeling" and I can't say with certainly "where" it comes from, just like someone who sits down and plays a piano "by instinct" can't tell you "how" they do it. What I do know-- both from experience, as well as from testimonials-- is that there is "something" about Alchemy Stones that give them properties that go well beyond merely being "a stone with paint on it." Alchemy Stones, however, are actually a collaborative effort between Sarah and myself. Sarah is an amazing artist with textiles, and certain stones inspire her to create special "Treasure Bags." 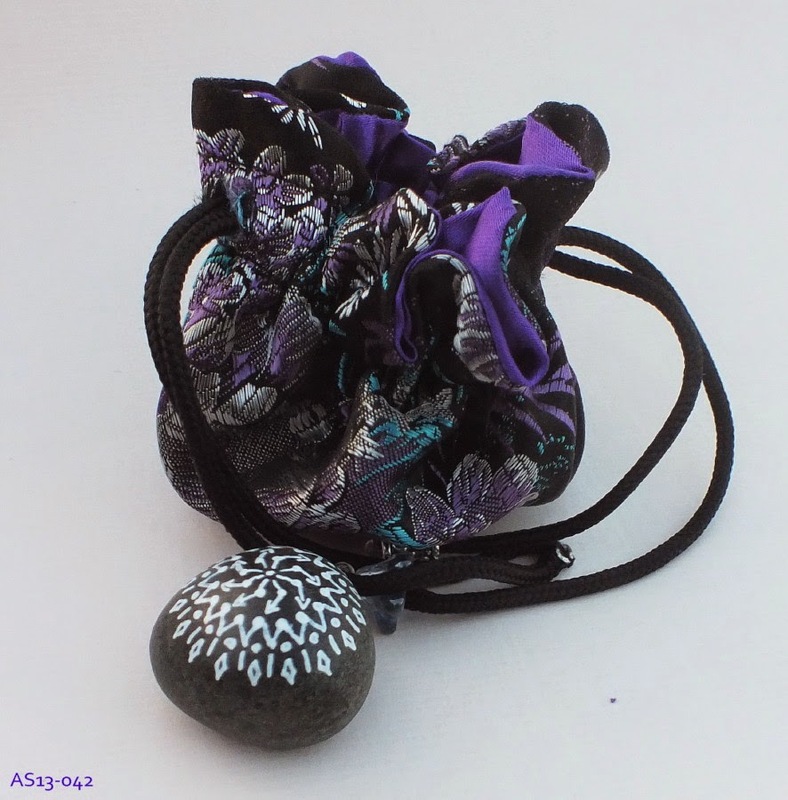 These are elaborate and completely hand made from vintage fabrics... with each bag made specifically to fit the pattern and energies of that particular stone. She only makes bags "for" particular stones; so I'm afraid the answer is almost always "no," when it comes to requests for her to make bags for other things. And only about 10% of all Alchemy Stones end up being offered with their own Treasure Bag. Sarah is also the primary "Metaphysician" at Alchemy Stones, applying her 30-odd years of experience as an Energy and Light Worker to interpreting the vibrations of each stone. Actually, yes-- that actually happens on the beach, when we are in the "gathering stage." Some I pick up may seem like the "perfect" rock to paint... but they'll give off an "Ewww! Leave me ALONE!" vibe, so they never make it home.